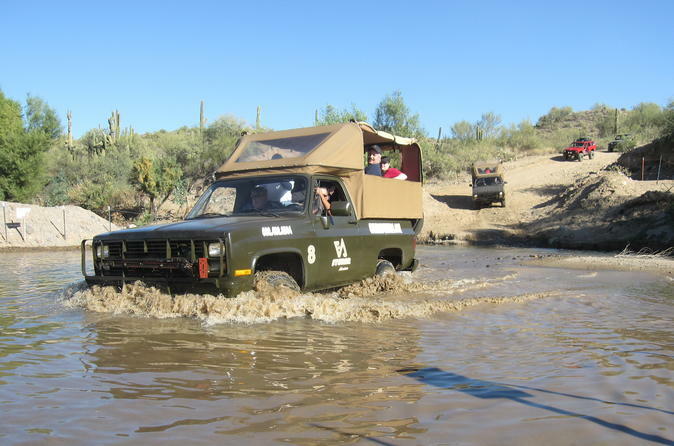 If you're an adventurer who wants to go off-road in the Sonoran Desert without getting knocked right out of your seat, set off on a 4x4 tour in a Chevy M1009 Blazer. This military-style vehicle with a powerful diesel V8 engine is tricked-out with the best shocks available, so you’ll be riding in style and in comfort over rocky, steep trails without breaking a sweat. Hotel pickup from Phoenix is included. After pickup from your hotel in the greater Phoenix metropolitan area, set off on your 4-hour excursion in the morning or afternoon. Climb aboard your tour vehicle, a Chevy M1009 Blazer that provides you and your fellow adventurers with awe-inspiring views and the power to behold the majesty of the Sonoran Desert from higher vantage points. The powerful vehicle is deceptively nimble as it ascends desert trails with a military-grade rear Gov-Lock system. Supreme handling and almost nonexistent slippage let your driver expertly navigate any trail with ease and confidence. Ford across seasonal creek beds and washes that may occur at a moment’s notice; whatever the weather conditions, the M1009 is well-equipped for any scenario. Relax and gaze out at the Arizona sky and the rocky red desert while you keep an eye out for any wildlife that roam the landscape. Afterward, you're transferred back to your Phoenix-area hotel.